A philosophy major is required to take both PHIL 3364 Ancient and Medieval Philosophy and PHIL 3365 Modern Philosophy as part of the minimum total of 30 semester credit hours for the Major. It is strongly recommended that these courses are completed as soon as possible after being introduced to philosophy. Given the importance of logical reasoning for philosophy and to provide the student with an in-depth acquaintance with formal logical reasoning, students choosing Philosophy as either their Major or Minor must complete PHIL 2303, Critical Thinking or PHIL 2352, Contemporary Logic. Philosophy majors choose an approved minor of 18 semester hours, 6 of which must be advanced. A degree plan should be arranged with the Philosophy Program Coordinator at the earliest possible time. The Death of Socrates by Jacques Louis David. 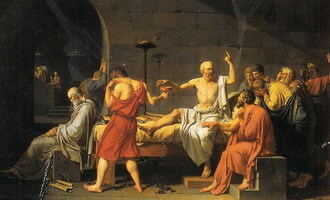 This painting depicts the last moments of Socrates. The following represents an example of how one might schedule courses to complete a philosophy major at Sam Houston State University. Students may take courses earlier or later depending upon their individual needs. In all cases, it is suggested that you consult with your advisor. This is intended as an illustration only.